The Parent Empowerment Program (PEP) offers a vibrant, holistic strategy to increase support to parents. Parents as Teachers – Parents are introduced to the format of the training. The goal of this session is to help parents understand discipline and skill building from a teaching perspective. Effective Praise – Parents learn about the use of effective praise to encourage steps in the right direction and to find positive solutions to problem behaviors. Preventive Teaching – Parents learn how to set their children up for success by using preventive teaching strategies. They learn how to determine reasonable expectations according to the child’s age and developmental abilities. They learn to establish home rules as a way to make expectations clear and consistent. Corrective Teaching – Parents learn a set of skills to use in responding to problem behaviors. Parents also learn the importance of having their children practice pro-social alternatives to problem behaviors. Teaching Self-Control – Parents learn to identify their emotions and how to communicate them in a helpful manner. They learn to help their children communicate emotions in a helpful fashion. Parents learn a set of skills to use when their children do not respond to corrective teaching. Teaching your child to problem solve – Parents learn the importance of teaching their children to solve problems effectively. As a result, their children develop the ability to make sound decisions as they get older. Strategies to teach rational decision making are emphasized. Setting goals through the use of charts and contracts – Parents learn how to set goals with their children. They learn to use charts and contracts as tools to help their child achieve goals. Family Traditions and Family Meetings – Parents learn the importance of establishing family traditions and spending time together as a family. They also learn some techniques for establishing family meetings so all members have an opportunity to share ideas, opinions and help make decisions. Parents who participate in workshops and classes benefit from the encouragement, problem-solving assistance and information. They will be helped to make informed decisions and take appropriate actions regarding their children. They will experience the connection to other families and access to more resources for themselves and their children. 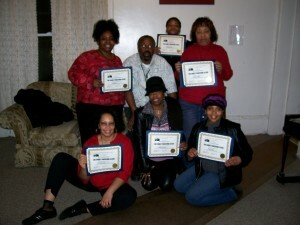 Parenting class graduates with trainer, James Cunningham.